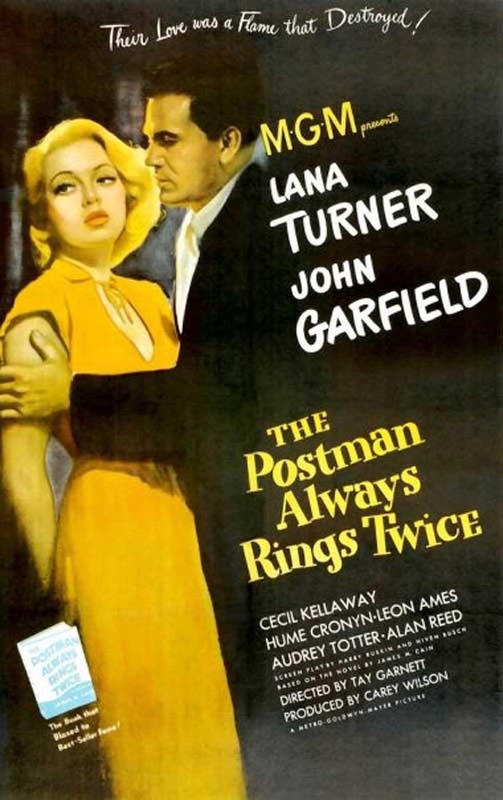 “The Postman Always Rings Twice” is a 1946 film noir based on the 1934 novel of the same name by James M. Cain. This adaptation of the novel features Lana Turner, John Garfield, Cecil Kellaway, Hume Cronyn, Leon Ames, and Audrey Totter. It was directed by Tay Garnett. The musical score was written by George Bassman and Erich Zeisl (the latter uncredited). Frank Chambers (John Garfield) is a hobo who stops at a rural diner for a meal and ends up working there. 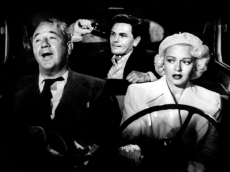 The diner is operated by a beautiful young woman, Cora Smith (Lana Turner), and her much older husband, Nick (Cecil Kellaway). Frank and Cora start to have an affair soon after they meet. Cora is tired of her situation, married to a man she does not love and working at a diner that she wishes to own. 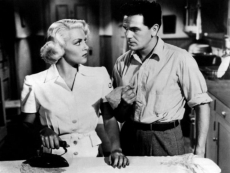 She and Frank scheme to murder Nick in order to start a new life together without her losing the diner. 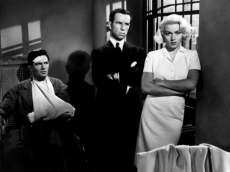 Their first attempt at the murder is a failure, but they eventually succeed. 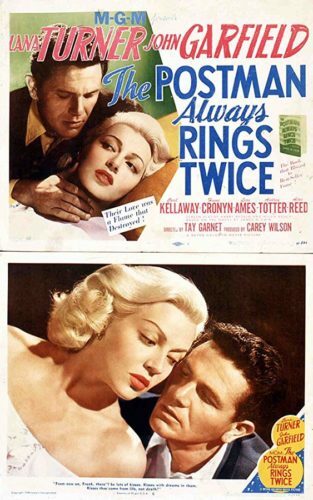 Lana Turner plays Cora Smith. 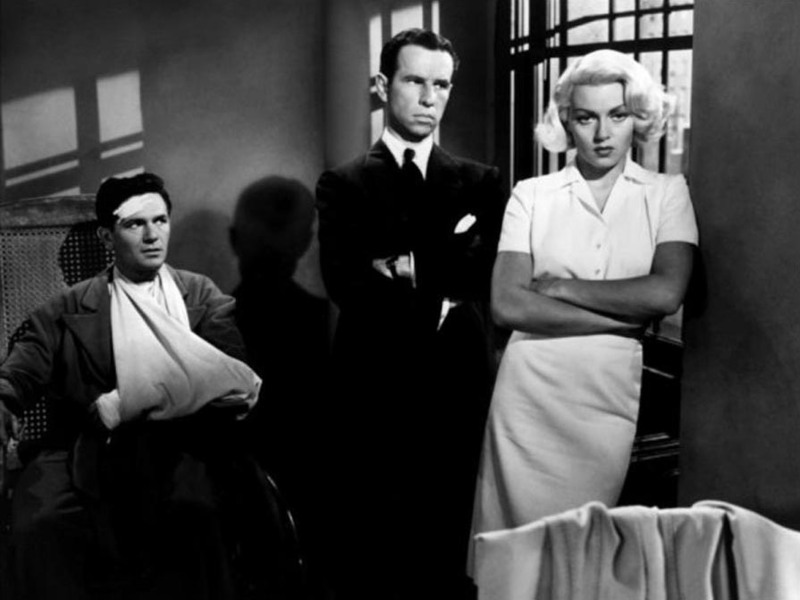 The film shows Lana in an “all-white look.” At the time of the movie it was as controversial a subject as the movie itself. As Cora, Lana was costumed throughout in a stark white wardrobe. The wardrobe was totally white except for two brief instances necessitated by the script. As a dramatic means of conveying mood, Cora is attired in a solid black robe for an early scene where she contemplates suicide with a kitchen knife. Late on in the film, she wears black a second time to attend her mother’s funeral.